Adhesive The gum or coating on the back of a stamp which allows you to attach it to an envelope. Album A book for storing stamps. Most albums consist of pages preprinted with stamp images, although a stockbook with pockets to hold stamps may also be considered an album. Block A group of attached stamps at least two wide and two tall. Booklet Pane A "page" of stamps from a booklet. Most panes consist of at least six stamps. Cachet A design or artwork on the left hand side of an envelope, found primarily on first day covers. Cancellation A mark used by the post office to show that a stamp has been used. Centering The position of the design on a postage stamp. On perfectly centered stamps, the design is exactly in the middle (there is equal spacing on all four sides between the perforation and design). Coils Stamps sold in rolls. Two opposite edges (most often the top and bottom) usually have straight edges rather than perforations. Coils are issued for use in dispensers or vending machines or for automatic affixing equipment. Commemoratives A stamp issued for a limited period of time, usually at the first-class rate and in a larger format than most stamps. Commemoratives usually honor persons, organizations, events or causes on significant anniversaries. Condition Broadly this refers to what shape the stamp is in and will help in determining a stamp's value. Condition considers questions such as: Is the stamp cancelled? Is it hinged? Does it have any flaws? How well it is centered? Cover An envelope with a stamp or other means of postage payment. Definitives Used on most mail, generally these are smaller size stamps printed in huge quantities, often in a single color ink, that are available from the post office for an indefinite period of time which may be many years. Denomination The amount of postage which the stamp pays. Face Value Another word for denomination. First Day Cover An envelope with a stamp canceled on its first day of sale. Gum Adhesive that is used to attach a stamp to an envelope. Hinges Small pieces of gummed paper that are used to affix stamps to an album page. Hinges allow for stamps to be removed from an album page without damaging the stamp. Imperforate A stamp sold without perforations or separating holes. Mint A stamp in the same condition as originally issued. This means it has its full gum and has not been hinged. Overprint An additional printing on a stamp that was not part of the original design -- such as additional words or symbols or even a new value. Typically overprints occur when there is not enough time to design and print a whole new stamp needed for some special reason or when rates increase. Precancels and surcharges are the most common types of overprints. Pane The proper name for a sheet of stamps sold at a post office. Most panes include a plate number and other markings in the margin or selvage. Perforations Holes punched between stamps to make it easier for an individual to separate two or more stamps. Collectors use a perf gauge to measure the perforations helping them to identify their stamp. Philately The hobby of stamp collecting. Plate Block A block of four or more stamps that has a code (usually one or more numbers) printed on the margin (selvage) identifying the printing plate used in the stamps' production. Postage Due When a piece of mail is sent that does not have the proper amount of postage affixed, the post office will require the addressee to pay the additional postage due. Hence, a special type of stamp has been issued to collect unpaid postage. Postal Stationery An envelope, card, or aerogramme sold by the post office on which the image of a stamp is preprinted. These stamps were printed as part of the stationery and thus can not be soaked off. Postmark A mark indicating when and from where a letter was sent. It may or may not also serve as a cancel. Precancels Stamps canceled prior to the mailing of a letter. U.S. precancels often consist of a city and state name between two black lines and are used primarily by bulk mailers who do some of the sorting of mail themselves. The idea is to eliminate the need to cancel the stamps; an effort to help to speed the handling of mail. Revenue Stamps Labels that do not pay postage but pay other fees or taxes. Se-tenant Two or more attached stamps with different designs. Selvage The margin of a pane of stamps that usually includes the plate number and other markings such as copyright notices. Semi-postal Postage stamps which are used to raise funds for a charity. These stamps are sold for more than their postage value with the difference supporting a cause or charity. 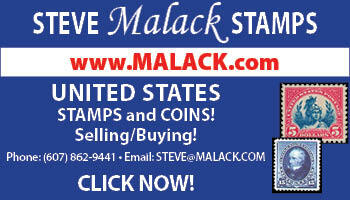 Souvenir Sheet Stamps issued in a special format primarily for stamp collectors. Most souvenir sheets include only one of each stamp design and usually have a special decorative border. Special Christmas, Love, and Greeting stamps that share some characteristics of definitives (larger printing quantities and may be reprinted) and some characteristics of commemoratives (often larger size and although they may be sold for longer periods than most commemoratives they are still sold for shorter periods of time than definitives). Surcharge A stamp that has been overprinted with a new denomination. Thematic A subject or topic of stamps such as animals or trains. Tongs Tweezer-like tools with a smooth gripping service used to handle stamps. Topicals Another word for thematic. A collection of stamps based on subject rather than country. Watermark A special mark incorporated into postage stamp paper as a security device, making it more difficult to counterfeit a stamp. Watermarks are thinner parts of the paper that sometimes may be seen by looking at the back of a stamp but often require dipping in special fluid to be visible.